Kay Rubuntja Napurrula belongs to the Warlpiri language group and was born around 1969. 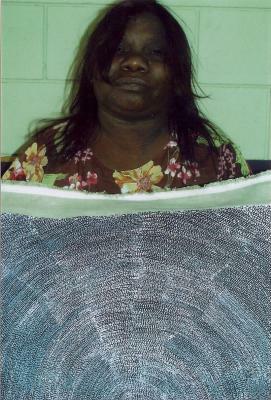 She comes from Willowra, 400 kilometers northwest of Alice Springs in the Northern Territory. Her sister Naomi is also a known artist. Kay's works are essentially interpretations of the landscape in her home region and they depict places of significance in the communities of her language group in the desert of central Australia. Kay’s paintings are minimalist and often monochrome in style, using only black, white or red paint. Her works are remarkably detailed dot-paintings and often have an exceptional optical quality. Concentric circles represent undisclosed locations for women where ceremonies take place. Kay has the fascinating ability to work with remarkable precision without the use of maps or guidelines to achieve this perfect round effect.